Ash dieback threatens 95% of all European ash trees and has already killed or severely damaged a quarter in southern Sweden and destroyed more than 80% of young ash trees in Norway. 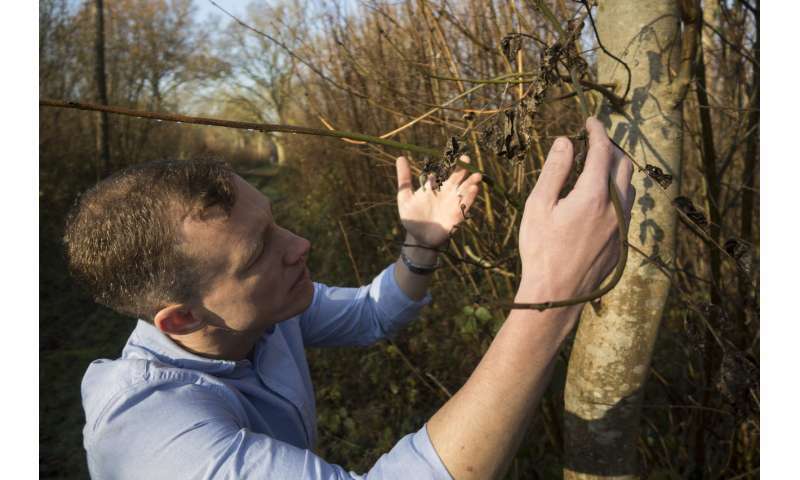 "It's incredible that from such limited genetic diversity the ash dieback fungus has already devastated trees across Europe," says lead author Mark McMullan from the Earlham Institute (EI) in Norwich. "Now that the disease is established, the introduction of genes from outside of Europe would tremendously increase the genetic diversity of the pathogen and seriously threaten the remaining ash trees." The researchers found that in fungal samples from the UK, Norway, France, Poland and Austria, there is low genetic diversity. The diversity of the fungus found across Europe is just an eighth of that found in a single Japanese woodland, so is likely to be a just a tiny fraction of that found across Asia. Allowing some of that Asian genetic diversity to come into Europe, for example by bringing in new fungal isolates, has the potential to increase the severity of the disease in Europe. Matthew Clark, senior author, formerly Head of Technology Development at EI and now Research Leader in Plant Interactions at the Natural History Museum, adds: "The risk is that if the pathogenic fungus gets the chance to mate and reproduce with just one more individual, the resulting offspring could have the ability to kill the remaining ash trees that have survived the disease so far". The disease was first observed in Europe in Poland in 1992, where it probably arrived on commercially imported ash from East Asia. It spread west and was first discovered in England in 2012, where spores may have landed from the continent. The fruiting bodies, each about the size of a match head, fire thousands of tiny spores that spread on the wind. Elizabeth Orton, a co-author on the paper from the John Innes Centre, says: "Trees have such a long life-time and their populations take so long to recover from attacks by invasive pathogens it is vital to restrict the movement of potentially infected plants into and around Europe in accordance with the 'precautionary principle'". National legislation has meant the movement of Ash trees into and around the UK has been prohibited because no pest free areas have been declared. Other pests and diseases, such as the Emerald ash borer beetle, have already been found in Russia and could push the remaining European ash trees to the brink. This pest has put five ash tree species in the US onto the IUCN red list, meaning they are threatened with extinction. The team suggests that it is now time to start growing seed orchards to generate a supply of ash tree seeds that are less susceptible to both dieback and other pests, something which Defra have begun work into with mass screening trials. Initial research in the UK and Denmark means that it is now possible to start selecting which trees to use as parents for trees that will be more resistant to ash dieback. BBSRC's Head of Strategy for Agriculture and Food Security, Brian Harris, says: "This paper reports significant findings of research funded by BBSRC in partnership with others. It demonstrates the importance of multinational collaboration and fundamental knowledge of pathogen biology for understanding the implications of tree diseases and informing approaches to their management." Ash dieback, caused by the ascomycete fungus Hymenoscyphus fraxineus, is characterised by dark brown or orange lesions on ash leaves followed by wilting, lesions of dead cells on shoots and then diamond-shaped lesions on the stems. Finally, the crown of the tree dies back and the pathogen either kills the tree directly or weakens it to such an extent that it succumbs to other pests or pathogens. In its native Asia, it is widespread and extremely diverse, but relatively harmless to Asian ash species.